He was the first black heavyweight champion in history, the most celebrated&#x2013;and most reviled&#x2013;African American of his age. 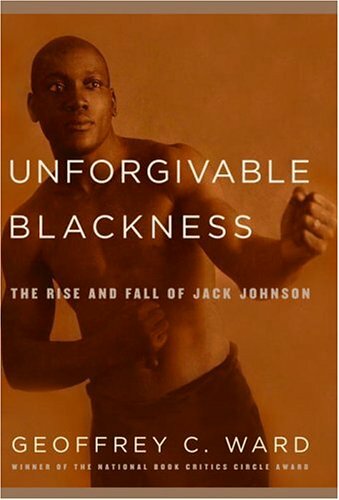 In <i>Unforgivable Blackness</i>, the prizewinning biographer Geoffrey C. Ward brings to vivid life the real Jack Johnson, a figure far more complex and compelling than the newspaper headlines he inspired could ever convey. Johnson battled his way from obscurity to the top of the heavyweight ranks and in 1908 won the greatest prize in American sports&#x2013;one that had always been the private preserve of white boxers. At a time when whites ran everything in America, he took orders from no one and resolved to live as if color did not exist. While most blacks struggled just to survive, he reveled in his riches and his fame. And at a time when the mere suspicion that a black man had flirted with a white woman could cost him his life, he insisted on sleeping with whomever he pleased, and married three. Because he did so the federal government set out to destroy him, and he was forced to endure a year of prison and seven years of exile. Ward points out that to most whites (and to some African Americans as well) he was seen as a perpetual threat&#x2013;profligate, arrogant, amoral, a dark menace, and a danger to the natural order of things.<br /><i><br />Unforgivable Blackness</i> is the first full-scale biography of Johnson in more than twenty years. Accompanied by more than fifty photographs and drawing on a wealth of new material&#x2013;including Johnson&#x2019;s never-before-published prison memoir&#x2013;it restores Jack Johnson to his rightful place in the pantheon of American individualists. Geoffrey C. Ward<b> </b>won the National Book Critics Circle Award<b> </b>in 1989. With Ken Burns, he is coauthor of <i>The Civil</i> <i>War</i> and <i>Jazz</i>. He lives in New York City.